Bodurov’s original compositions mixes jazz and Bulgarian folk together in a series of fascinating and enjoyable musical interactions. 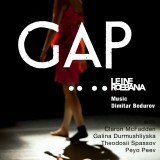 Stamps from Bulgaria 2008 in the top 10 Jazz CDs from Holland for 2008! The Bodurov Trio brings a welcoming and original sound in Jazz – not in a corny, boring way as it is so often the case with combinations of Jazz and Balkan music, but totally organic, warm and with guts. 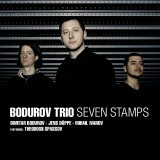 The Bodurov Trio approaches with the same intensity the fast and complicated as well as the slow and soulful songs. A must have for everyone, interested in music from this region! With originality as a driving force, one can almost taste the Bulgarian culture and landscape! As a pianist Bodurov is not only an amazing talent, but also a musician, who did not forget about his roots, yet does not stand still! With this new album Bodurov lives up to his promise! The more you listen the more secrets come out of this album! The playing is interactive, dance like but sometimes also serious and contemplative. The ideas are distinct and powerful. The Bodurov Trio elegantly transports an emotional landscape of Bulgarian Folk culture! Bodurov trio is “at home” with the irregular Bulgarian measures, which are fully integrated in their music. Particularly special is the way the Bulgarian folklore forms the unique sounds of the band. This is a spectacular piano trio recording with many innovative approaches, as well as ethnic flavour! The question is: how much folklore in jazz and how much piano in folklore? The Bodurov Trio makes the Bulgarian rhythms more recitative, communicative, transforms them into their own distinctive groove. An organic unity of rhythms, jazz and foklore. Convincing and dynamic! Definitely worth listening. Jazzos are not often in love with the melody, but for the Bulgarian piano talent Bodurov, this seems to be the most important subject in his music. With a strong influence from the folklore of their homeland Bulgaria, this band leaves a great impression on the listener interested in worldjazz. The rhythms are strange, the sphere is intimate, great musicians who make make this album warm and sympathetic.